Drop forged from Carbon Steel. Duly hardened & Tempered. Available with or without sleeves. We are amongst the reputed organizations, highly engaged in offering an optimum quality range of Box Joint Water Pump Plier. To meet variegated demands of our esteemed clients, we are engaged in manufacturing and exporting an exclusive range of Slip Joint Type Water Pump Plier. We are successfully meeting the varied needs of our patrons by offering a wide gamut of Slip Joint Water Pump Plier as per their precise needs. We are involved in trading and exporting excellent quality Box Type Water Pump Pliers in Jalandhar, Punjab, India. 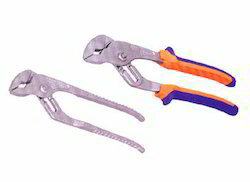 Our offered Box Type Water Pump Pliers are widely appreciated by our clients which are situated all round the nation. 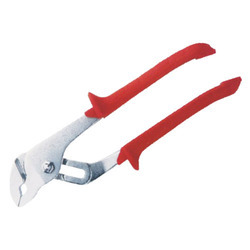 We offer Box Type Water Pump Pliers at most affordable prices. Carbon steel and chrome vanadium steel hardened and tempered. Precision adjustment joint, box type, providing optimum adaptation to object to be gripped. Long durability achieved by additional inductive hardening of gripper jaws. Narrow head, therefore also appropriate for work in small spaces. For gripping and holding pipes and angular profiles such as hex nuts in the installation area.